There are drawbacks to porcelain palettes, and one drawback is that most aren't cheap. Not all ceramic palettes are created equally, so before purchase, it really helps to consider how you use a palette and how you like to paint along with the setup of your desk or studio, and then do a lot of research. I've tried and tested several porcelain watercolor palettes, so I thought I would share my experiences along with a few tips on what to look for and what to avoid when choosing one. Below is a detailed overview of available porcelain palettes along with my reviews of all-in-one porcelain palettes. Before we begin, it's important to understand the main types of porcelain watercolor palettes and how they can be used. Porcelain palettes used mainly to store paint. One of the greatest advantages of a porcelain palette is how well watercolor mixes on its surface. If all you need is a palette to hold paint, I'm not sure a porcelain palette is the best choice, but it might be if additional needs (mixing surface, lid, etc) are considered. If you just want a small porcelain palette to hold a limited number of paints, I recommend researching items in stores so you can closely evaluate each palette's design. Some have poorly crafted wells which can be difficult to use and can even damage brushes. For example, I have this palette which has not worked for me at all; there's no lid and the wells are too small and deep to be of any real use. Though these type of porcelain palettes tend to be more compact, a mixing surface is still needed, though this is sometimes incorporated into the lid. However, once these two items are side by side on a desk, they can take up as much space as an all-in-one palette (see below). Pro Tip: If this is the type of palette you want, I highly recommend a porcelain egg platter. The oval wells are absolutely perfect—generously sized, gently sloped, and large enough for mega brushes. I'm smitten with this 24-well beauty. Porcelain palettes used for mixing & painting. These porcelain palettes are more common and can be very useful. For example, in my limited studio space, I'll often store paint in pans and use a small porcelain palette for mixing. (Ceramic flower palettes are super useful, and they're fairly affordable and easy to find in art stores. Amazon and Jackson's carry them.) Some artists prefer painting with watercolor directly from tubes and use these palettes as they paint. It's easy to distinguish a mixing palette because it often has a limited number of large, deep wells (or none at all) and is usually missing a lid. A mixing palette can be compact and some even stack. However, unless you own a lot of them, you may need something extra to hold paint so this solution may not be a space saver. Still, depending upon your setup and how you prefer to paint, using a porcelain mixing palette or two may take up less space than an all-in-one porcelain palette (see below) and allow you to take advantage of porcelain's exceptional surface. Pro Tip: A plain white ceramic plate makes an excellent yet economical mixing palette, and local dollar and discount stores almost always have them in stock. Porcelain palettes designed for all of the above. I call these all-in-one or studio palettes because these porcelain palettes can store a lot of colors and are extremely useful for painting. In other words, they can do it all. This palette is usually all an artist needs for all aspects of watercolor painting, and with very little care, an all-in-one porcelain palette can last a lifetime. However, these palettes tend to be huge, heavy, and can break or chip if bumped or dropped. Because of this, they aren't portable and they work best in a studio or at a large desk. Also, it can be difficult to remove, add, or reorganize paint colors without wasting a lot of good paint. These palettes also are rather expensive. However, light use rarely hurts these palettes so if you're interested in an all-in-one palette, it may be worth shopping used or working out an artist trade. I've also found great deals on new all-in-one porcelain palettes through retailer sales and more. Pro Tip: Most porcelain palettes are unfinished on the bottom, and all-in-one porcelain palettes are also heavy so they can easily mar a desk or tabletop. To protect my work surface, I applied felt sticky pads to the bottom. I favor white pads because they match but nearly any will do. For this post, I'll concentrate on reviews for large, all-in-one studio palettes. These can be the most difficult to judge without seeing them "in person." Plus, they're the most expensive—in cost and shipping—so purchasing one and then having to return it can be a painful mistake. The American Journey Cavalcade Palette is similar to others on the market. (See a lookalike at Jackson's.) It's the palette I'm currently using in my studio, and it takes up about a quarter of my small desk. It lists for nearly $100 USD but Cheap Joe's constantly offers discounts. I purchased it new during a fantastic holiday sale for around $25, and it's currently my main palette. The standard wells are nicely sized, but the lip that meets the mixing area is high. I've combated this obstacle by mounding paint in the center of the well, but I would prefer shallower or sloped wells. Like all porcelain, the mixing area is superb and I like the center divider. Because I use this palette while sitting at a desk, the wells facing away from me are a bit awkward. I originally applied paint against the outside wall of each well, but I quickly figured out that this makes the paint even harder to reach from where I sit. The corner wells are poorly designed, more appropriate for paper clips than paint, so I consider the Cavalcade a 22-well palette. I think a better design would be to remove the divider between the two corner wells to create one extra-large well in each corner. The lid fits loosely but works fine, and I really like that it's clear. It does have odd recessed areas in the top that I don't find useful—I can't even figure out the purpose of these—but they're easily ignored. Joe's and Jackson's both offer a smaller version of this palette, so if you don't need as many wells, this might be another option. Artist Tom Lynch's signature palette is produced by Jack Richeson, a company that produces and brands several artist's palettes. I found a great price on a used one, so I bought it for storing and testing additional colors. I think the design of this palette is very nice. The wells are located on only three sides, and though they are large and deep, they gently slope toward a shallow lip at the mixing area. These wells are designed for easy access, and I love the accommodation. The lid fits loosely but it's secure enough to keep out dust. If you want to be extra cautious, the palette comes with a roll of foam tape which can be used to attach the lid more securely. A few negatives... those silly brush holders located at each back corner along with the hard-to-access wells at each front corner. In Tom's video, it appears as if he doesn't really use those front wells either! Also, for a palette this size, it has a limited number of wells. Most artists (like me) prefer to have more colors in a studio palette, which is why this palette is currently not my main squeeze. 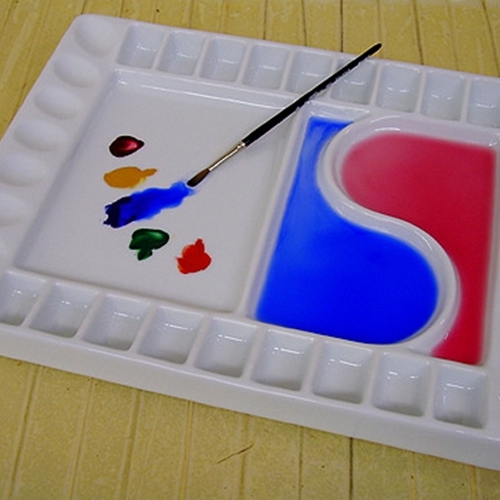 This is another Jack Richeson palette but designed by Artist Stephen Quiller. I don't own this palette, hence the cheesy stock photo and MIA stats, but I've evaluated it in stores and think it's a fine option if it will work for you. The wells are generously sized, there are plenty of them, and they slope nicely toward the mixing area. This is one palette where I think the corner wells actually work. I can't explain why (maybe it's the arrangement?) but they just feel accessible in this palette. I'm not sure they're useful for storing paint, but they're large enough for mixing wells or diluting paint. The wells in a circle are what kept me from this one. Stephen Quiller is all about color theory, so you may love it if you're into painting around the color wheel, but I didn't care for how this arrangement made me face the backside of half the wells while sitting at my desk. This palette has the largest number of standard wells with the smallest footprint, so it may work better in smaller spaces. Quiller also offers this palette in plastic, but plastic and watercolor usually don't mix (literally) so I recommend avoiding it along with most other plastic palettes. A palette that makes me go "Hmmm..."
The side wells could be great (they have that lovely egg shape that I enjoy) but they could also be too shallow and rather useless. Also, the main wells appear somewhat deep and narrow. In this lovely photo at Fine Art Store, it's apparent that the lip separating the wells from the mixing area is high and might be difficult to navigate. Along with all of that, there's no lid. (At this price point, there should be a lid. I mean really, plastic is cheap.) And again, those ridiculous brush holders! But what really makes me go hmmm is that swirly mixing divider. Cute, but not cool. The mixing area gets really narrow where the swirl meets the side of the palette, and this creates a tiny area that's pretty much useless for mixing. When it comes to mixing, give me wide open spaces any day over tight corners. However, I'll keep an open mind. If you've used this palette and love it (or hate it), feel free to leave me a comment below. I'm sure my lovely readers will appreciate your input, as well.